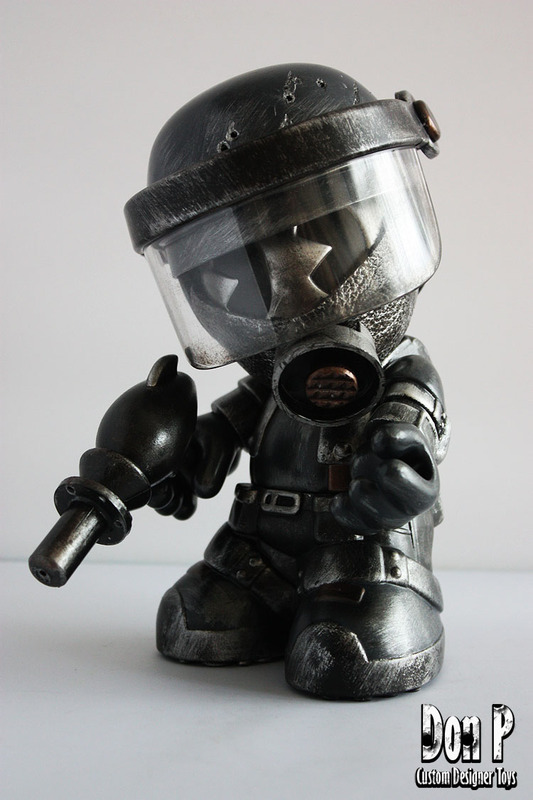 Don P shares with us one of his sweet Kidrobot Mascot customs- this one is KidApocalypse. Diggin the muted palette, bullet holes and brushed-metal-look on this one. As always, this Don P custom is highly detailed, with a gun accessory and a removable helmet with flip-up face shield. Check Don P's Facebook page, shop and blog to see more! 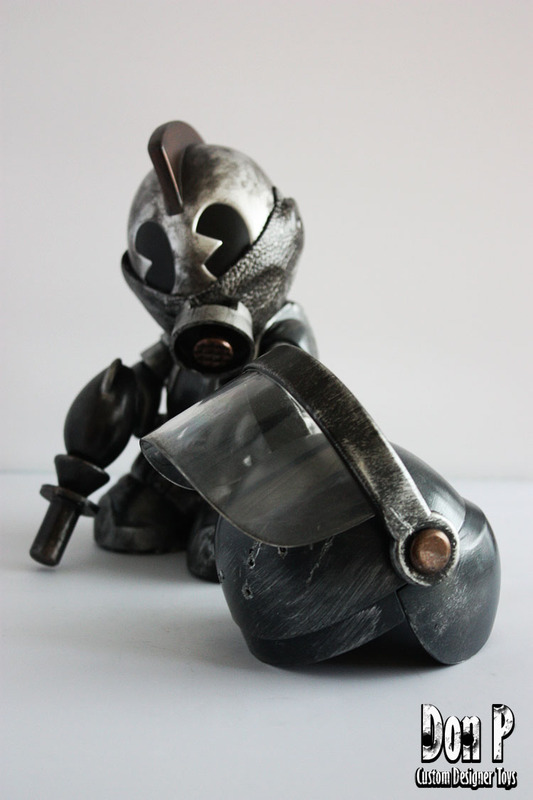 You can still get in on Don P custom-made KR Mascot by purchasing a preorder here. You choose the theme from a long list, and Don P will customize it in your desired style. 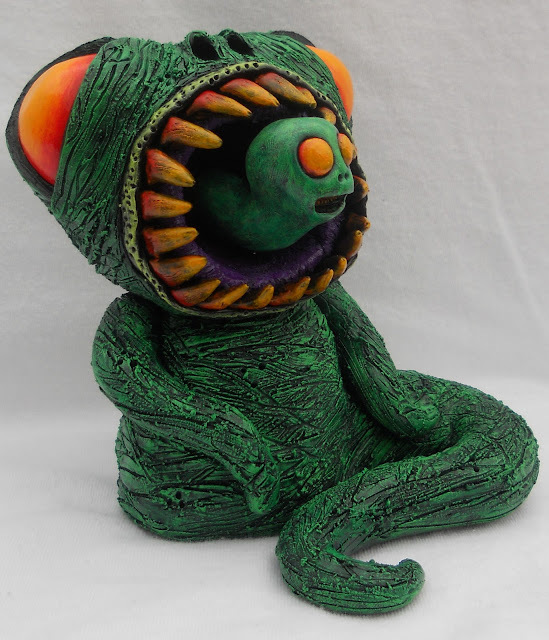 Jon Malmstedt of Rampage Toys sends us these colorful images of his latest custom collaboration: this time the platforms are Kikkake's Bear and Elephant figures. You can choose blank ($20) or custom-painted versions ($25) of both sculpts- go to the Rampage Toys shop to see them. 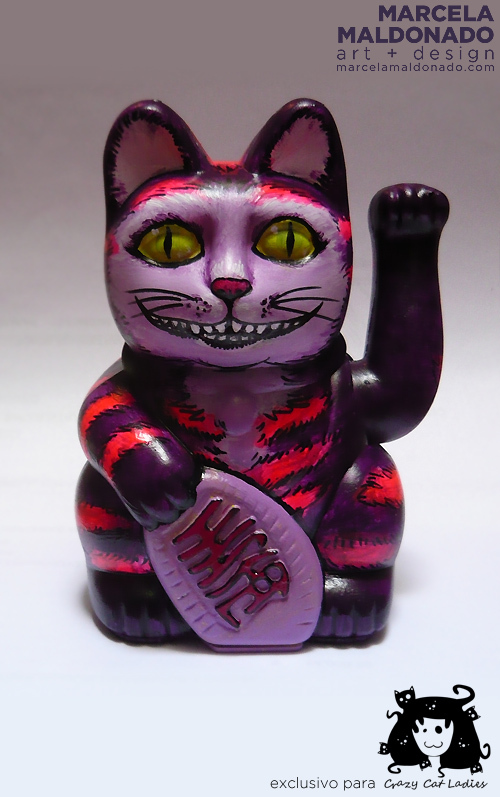 Jon also has a number of other REALLY cool, colorful custom toys up for sale there, in addition to several different Ugly Unicorn vinyl toys. If you haven't been to the Rampage Toys shop lately, go there! A lot has changed- there are about two dozen different products listed there, and Jon says there will be more releases every Friday! Also, there may be another Tenacious Toys exclusive Ugly Unicorn later on this year... stay tuned! Michael Bugshub Krenzin's custom Lunartik in a Cup of Tea figure is titled E.TEA. 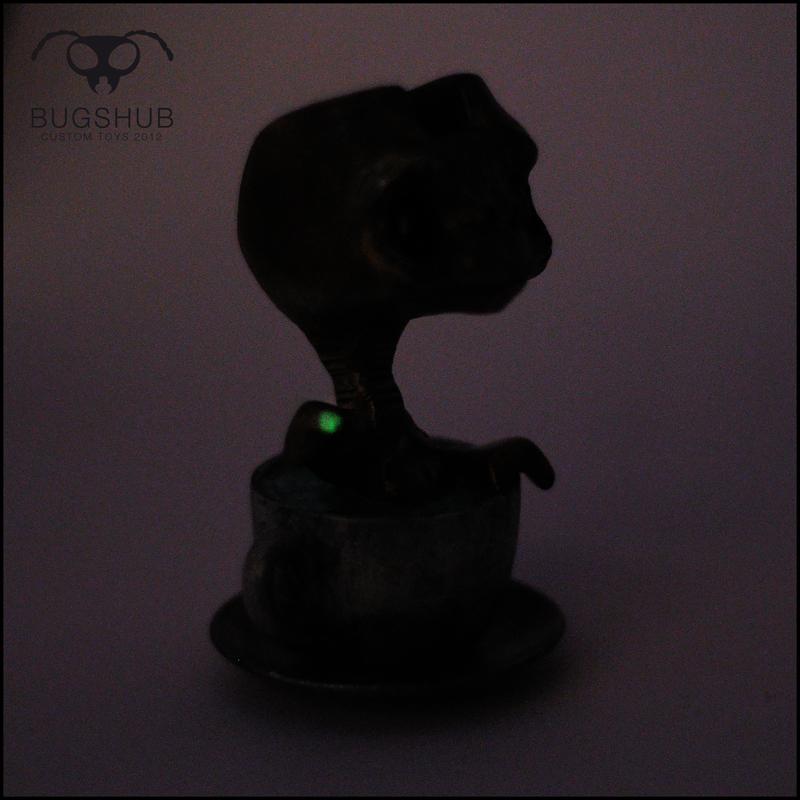 Looks like the finger lights up, or glows! Nice touch! 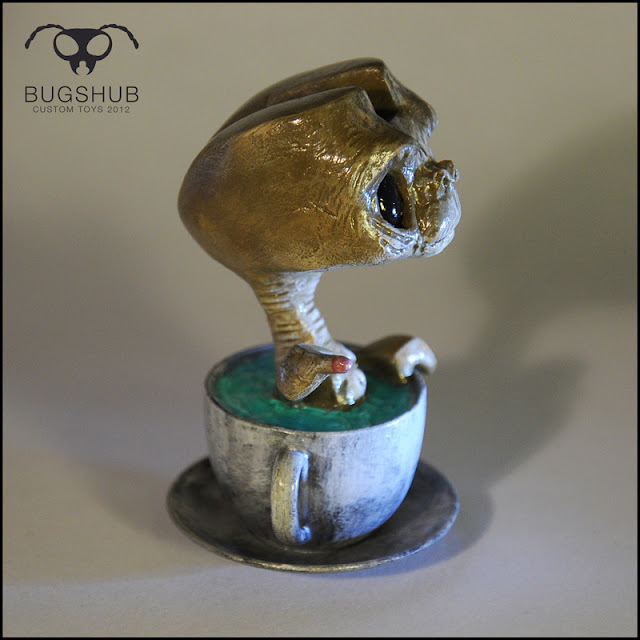 Go visit the Bugshub website here to see more customs by Michael. 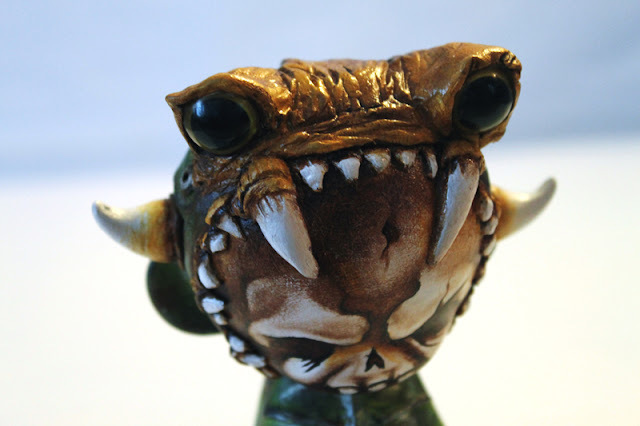 Tesselate has revealed his 2.5" Keyeyes YO! 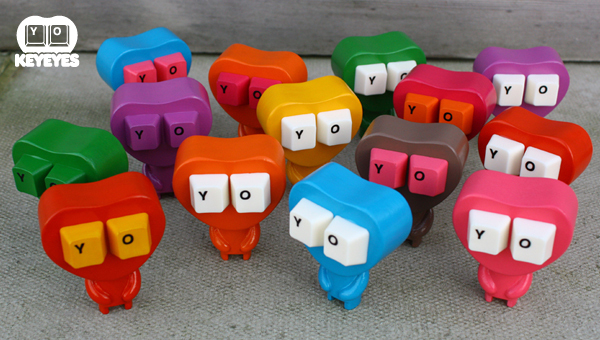 resin figures which are available in many colors in his shop for only 9 pounds each! A bargain, and a super-cute Valentine's Day gift for your partner. 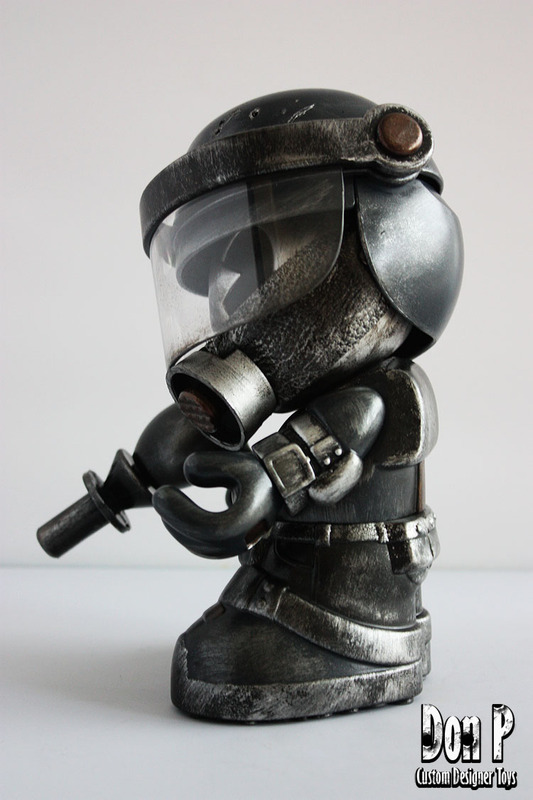 Don't forget, we also have an exclusive Mini Munny series by Tesselate called the Double B Squad, which you can purchase in our shop here. In stock now: a series of six different Ultraman and Ultraman Villain figures, including Ultraman and Ultraseven (above) which come in a 2-pack. 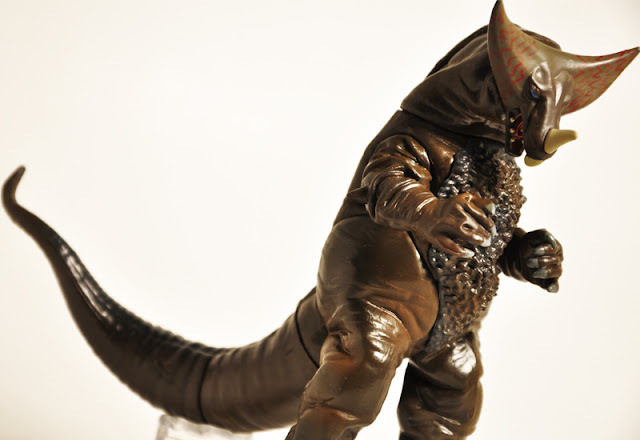 Also available: Gomora, King Joe, Alien Nackle, Alien Baltan II and Vakishim! The Villains are about 6 inches tall, Ultraman and Ultraseven clock in at about 5 inches. 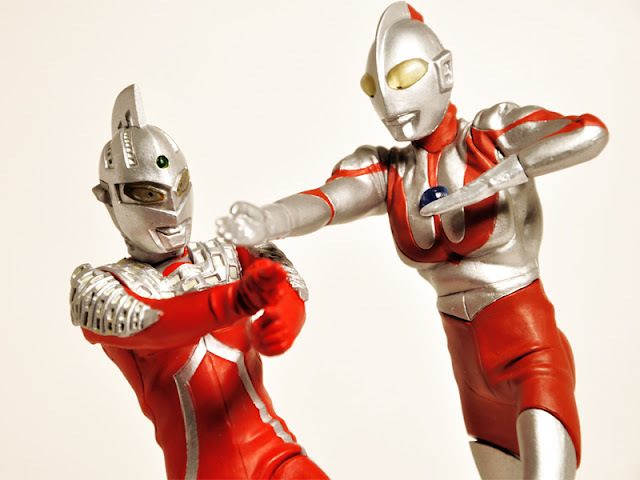 Each figure is $11.95, except for Ultraman & Ultraseven, which are $11.95 for the pair. Go here to buy them! 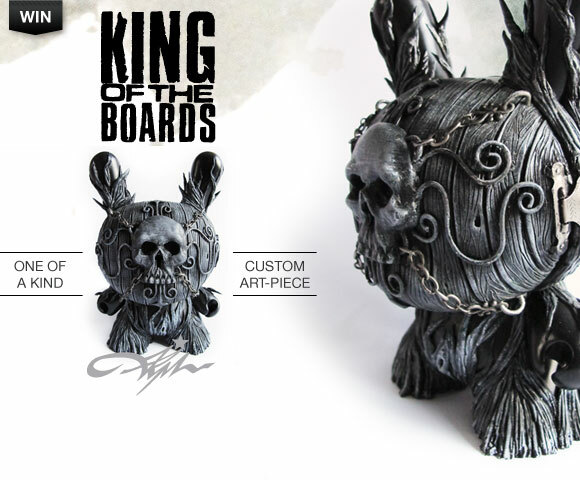 Welcome to Kidrobot’s Forums artist custom giveaway, KING OF THE BOARDS. 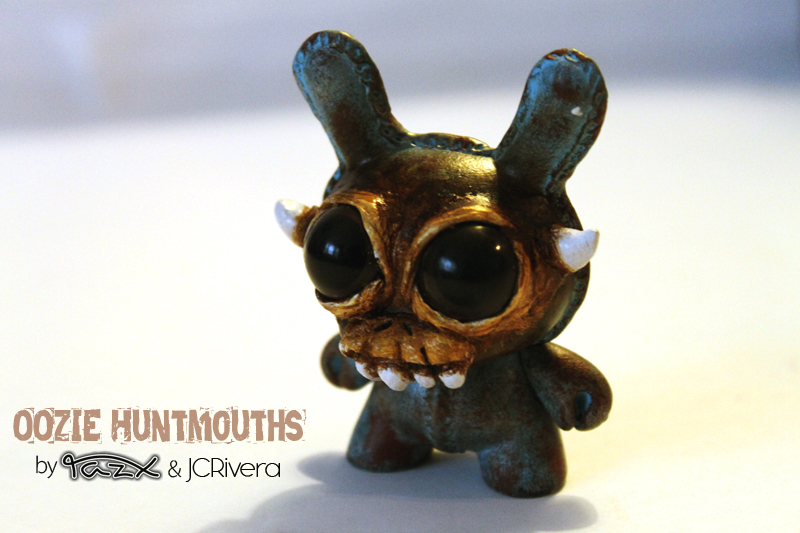 This unique contest arbitrarily shines the spotlight on one of the many insanely talented customizers and outstanding members of the vinyl community, and hooking you up with a chance to score this exclusive hand-crafted 8-inch Dunny by J*RYU. Click thru to learn more about my buddy JRYU, and also learn how you can enter to win one of his coveted customs. Click below to buy this one. It's only $5. Do it. Don P (Patrick Lippe) is taking a unique course in his customizing, focusing on the underused Kidrobot Mascot platform. Above are a couple of his concepts: KidDwarf and KidMedieval. Sweet friggin customs. I'm diggin the chain mail hoods and those moustaches & braided beards! Don P says "They both love to cut ears." 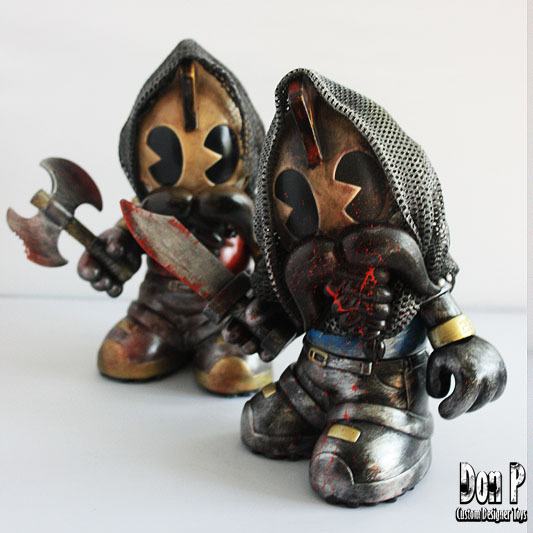 You can order your own commissioned Kidrobot Mascot custom from Don P here. Every Mascot is unique.....i don't make a Mascot twice. It can be based on a Mascot i did before or a different approach. Shipping to the US will take 2 weeks. I need one month to make your custom. OsirisOrion's "Doppleganger" artwork is printed on high quality photo glossy paper. 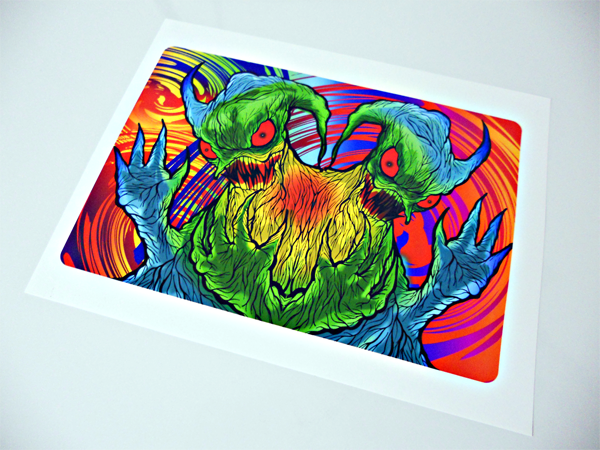 Each print is hand numbered and signed by the artist (on the back of the print), and limited to 50 prints. Once these are gone, they are gone! And they're only $15 each so get on it fast. Osiris is offering free shipping in the US and just $5.00 US for international shipping. 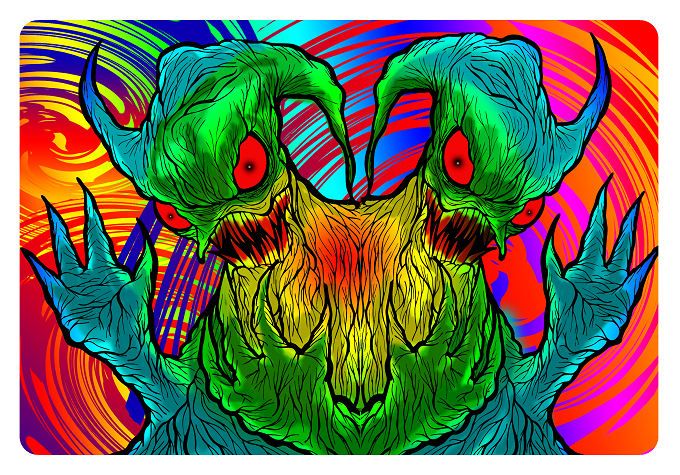 Prints will be shipped flat in a poly bag with header card. Buy yours here in OsirisOrion's Storenvy shop. The world is in turmoil after years of rebellion war and hate the planet erupts into a nuclear hellfire. Earth is a barren inhospitable wasteland with few civilizations dotting the once fruitful plains. Man is virtually no more as Mutation took hold accelerating the course of man’s adaption to this new and harsh environment. Although life may still exist on this foul planet War and hatred still tears it asunder. Oculus Viri along with a small band of what is left of the united states still hold up within the ruins of the former white house. Imperator Lacertus the disgustingly cruel leader of the FOEZ, Skekiltor his right hand, and Clawgrugg the general, Will stop at nothing to crush the only thing standing in his way. Oculus and his gang of rag tag mutants. Oculus Viri the leader, Sam Atom the brute, and Noctu the mind, are working to amass an army of their own kind in order to protect the freedoms of their people. Who will win the war for control of this post-apocalyptic civilization? This is now YOUR charge, choose a side amass an army of your own battle your friends and choose the fate of this new world! 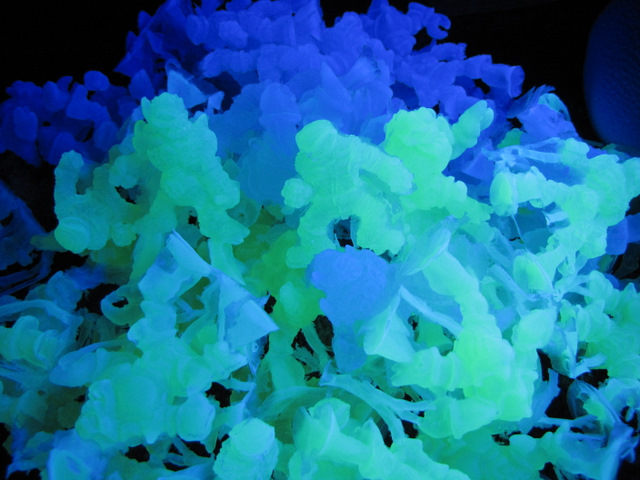 Backlight shot of the glow sets, which all contain a UV glow additive. 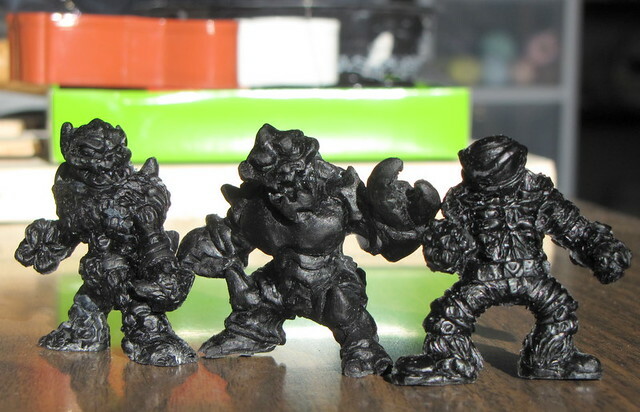 At just over 2 inches, these mini-figures are in scale with classic Monster in my pocket toys. There will be 30 sets total available in the Papagrim shop. They will be $20.00+sh per set; buy 3 sets or more and get free shipping on entire order in the USA. There will be 10 sets violet glow, 10 sets black, 10 sets green glow. 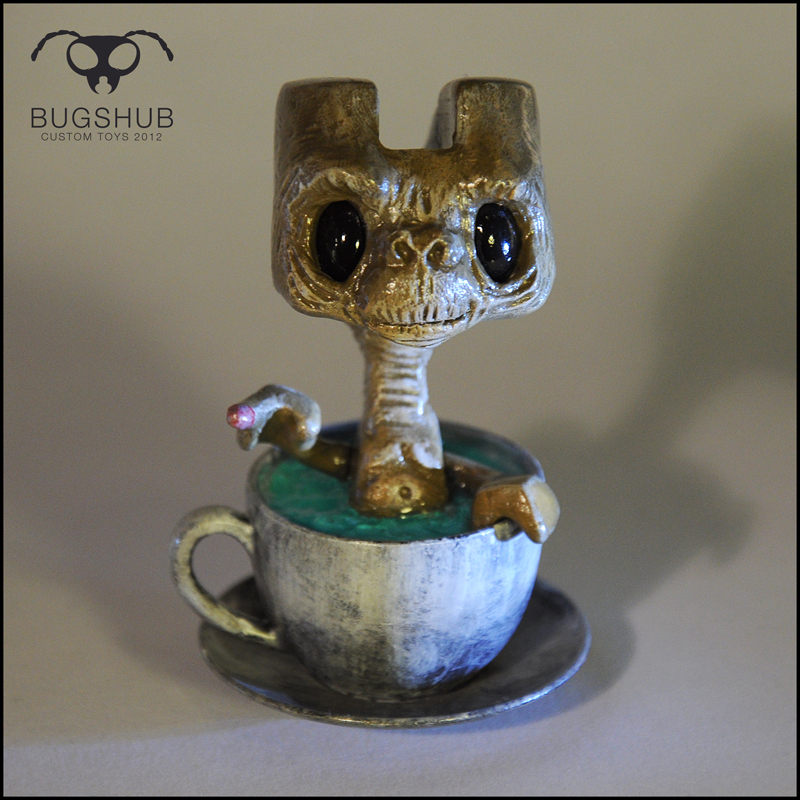 Each set will be signed and numbered by Steven Patt, the designer/sculptor/caster. Packaged bag and header card style. Available now! With the Festive season still running thick (ahem) through his creative veins (cough cough) Creo Design is excited to announce a super discount offer for 10 super hard working TADO fans! 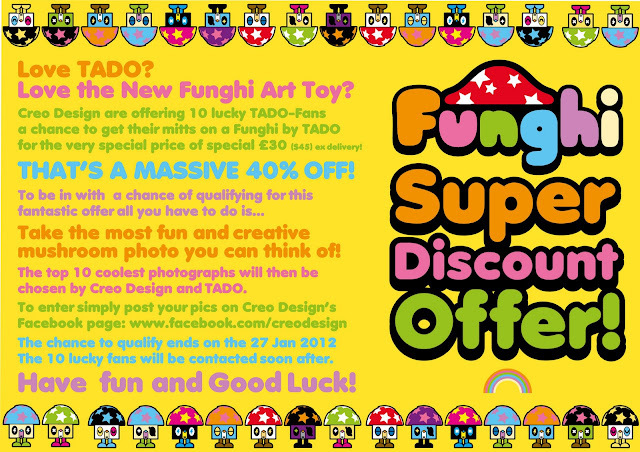 CD are offering a massive 40% off Funghi by TADO - that means you can get your Funghi for £30 or $45 ex delivery! To be selected for this cool offer fans must take their most creative photograph of a mushroom and post it on the Creo Design facebook page wall - www.facebook.com/creodesign - the 10 best will be picked by CD and TADO after the closing date of the 27 Jan 2012. 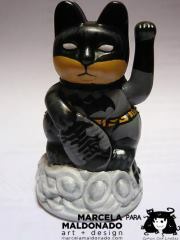 I'm repainting Maneki Neko plastic dolls, the one with the moving arm, I repainted them with acrylics and, any subject, but specially pop culture icons such as comic superheroes, cartoon characters, anything even by request. 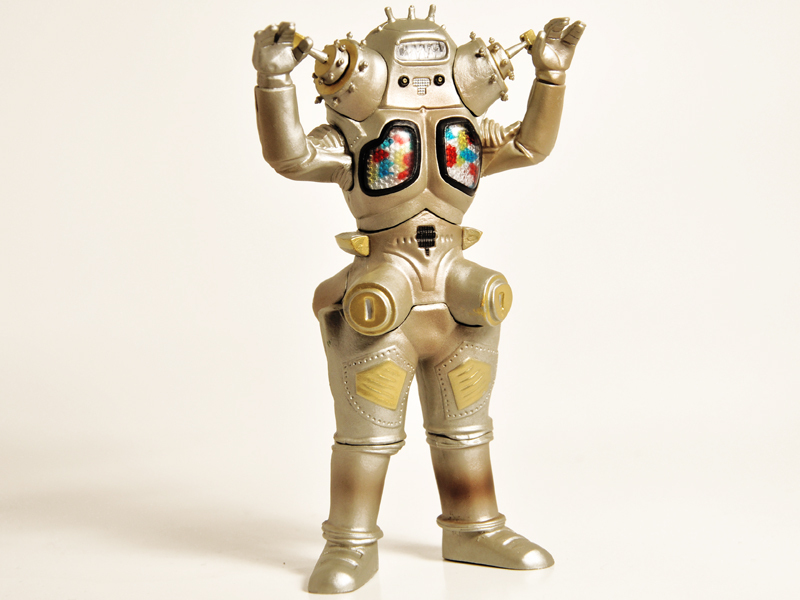 Dave's Corporate Monsters series, which was a Tenacious Toys Exclusive, is now sold out after 2 days. 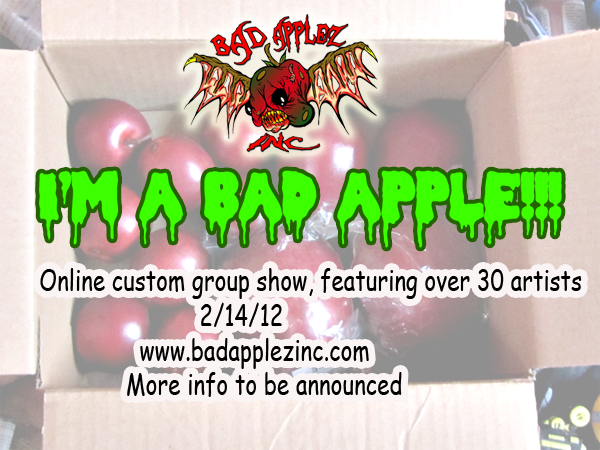 My friends and talented artists Mike NEMO Mendez and Rob OsirisOrion Ingellis are celebrating the launch of their company Bad Applez Inc. with an online group show they're calling "I'm a Bad Apple." 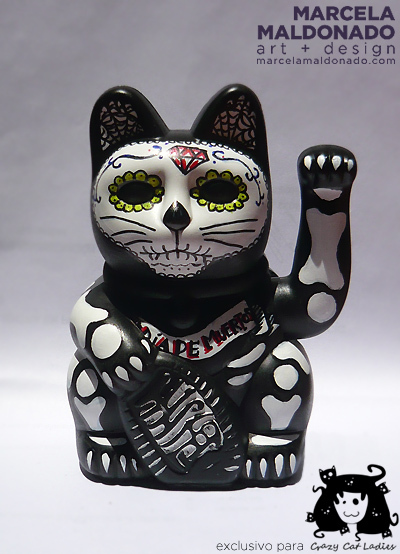 Bad Applez Inc. is currently self-producing resin figures as well as garage kits that harken back to the good old days of DIY toy creation. Going live on Valentine's Day (February 14, for us idiot guys who might actually forget the date), the Bad Applez show will feature the works of 30 talented artists. You might have surmised that an apple will be the platform for this show- not rotten old real apples, but nice cheap plastic apples that NEMO found. You might have seen some of them posted on Facebook by the artists that received the platforms! Watch for more info posted here, on the Bad Applez site and lots of other blogs! Fraziel in the Daylight., originally uploaded by valleydweller. 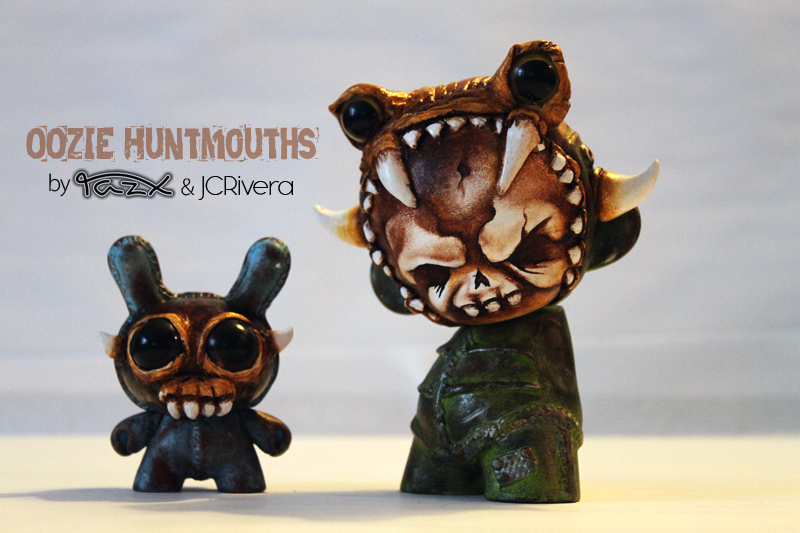 TazX and I worked on a 3" Dunny and a mini munny. We wanted to combine our styles to see what would come up from it. We created some creatures that we called them Oozie Huntmouths. These are Half Rusted Machines and Half creatures. 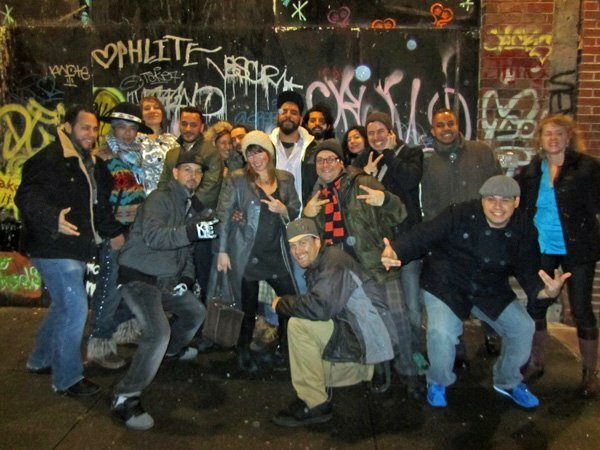 What's a typical night like in NYC for people like us? Here ya go: a big mob of toy artists, creators, designers, traditional artists, sculptors, toy retailers on the way to Art Battles from the Marka27 solo show. Good times. Get some Orbitz coupon codes and join us next time.